All of the accounts mentioned above are eligible for protection by PIDM. Interest is calculated daily and paid 6-monthly. Effective Date: 08/03/2018. These are indicative rates and should not be construed to be applicable for any specific transaction. The bank reserves the absolute right and discretion to change the rates below. 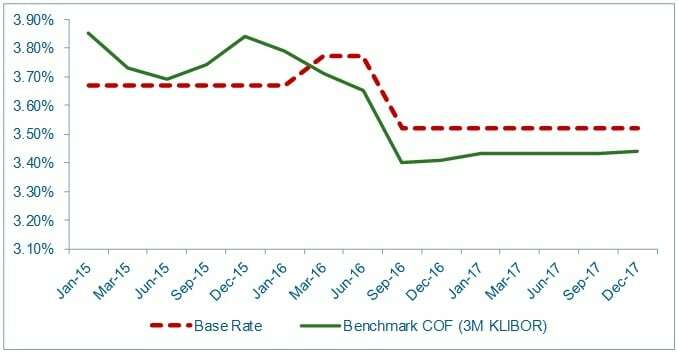 The BR we offer on this product is made up of two parts, our benchmark cost of funds (COF) and the Statutory Reserve Requirement (SRR) cost imposed by Bank Negara Malaysia. Our benchmark COF is the marginal cost of raising funds for the mortgage loans. Note: Effective Lending Rate may vary if BR or BLR changes. Base Lending Rate = 6.95% p.a. Published rate as at 24/04/2019. The bank reserves the absolute right and discretion to change the rates below. Foreign Currency Deposit Account ( FCA) interest rates are dependent on market rates and could fluctuate from day to day. Please check with your nearest branch or contact your Relationship Manager (RM) for the latest FCA interest rate. Effective date: 1 April 2019 – 30 June 2019. Not applicable for new individual loan / financing applications from 2 January 2015 onwards.